Wir bewegen uns, mal wieder, etwas außerhalb meiner eigenen Bücher und in den Bereich von Autoren, die ich kenne – damit meine ich jetzt nicht, dass ich mal ein Buch von ihnen gelesen habe, sondern dass ich sie wirklich kenne. Ever thought about capturing a queen, amassing real estate gold, or striking down a zombie or two? For centuries, games have stimulated the imagination. They have divided, and they have united. They have driven our competitive spirit and indulged our fancy. Live an entire lifetime in a few rolls of the dice. Push a few buttons and sustain perfect health. Essentially, games have and will continue to provide people worldwide a break from the everyday grind. 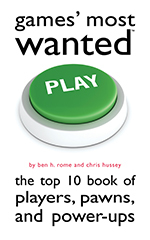 With more than forty chapters, Games’ Most Wanted™ whisks readers away into the fantasyland of games. Learn more about board games that have been passed through generations, video games that predict the future, and card games that have brought down the house. Ben H. Rome and Chris Hussey also reveal the culture behind the entertainment—the codes of conduct, the language, the conventions, and the workshops— proving that leisure can be a lifestyle. Something they won’t reveal: how to rescue the princess. Regardless of the hand you’re dealt, Games’ Most Wanted™ is sure to cure any boredom. Ihr bekommt es bei Amazon, Thalia, BOL.de, Libri, Sosch und was weiß ich wo sonst noch so. Betrachtet meine Liste hier, wie gewohnt, als absolut unvollständig.